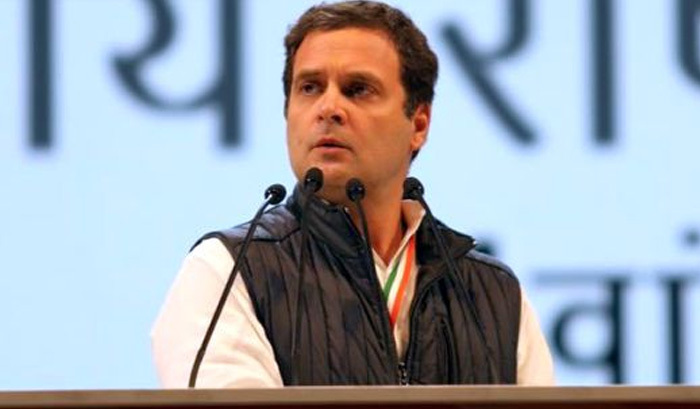 New Delhi: The BJP Sunday said it will keep a "telescopic view" on Congress president Rahul Gandhi's election affidavit, a day after the saffron party alleged a rise in his income between 2004 and 2014. There has been a "huge jump" in the income of the Congress leader, BJP national spokesperson Sambit Patra alleged at a press conference, but did not provide any evidence or document to substantiate his claim. Patra challenged Gandhi to file a defamation case against him, claiming that he is stating facts with evidence.There was no immediate response from the Congress on the charges levelled by the BJP. "The people this time in the country and the BJP in particular will keep a telescopic view on the nomination of Rahul Gandhi... Where ever he contests elections," Patra told reporters. Gandhi's income has risen from over Rs 55 lakh in 2004 to Rs 9 crore in 2014 as per his election affidavits, he alleged, asking "how can an MP, who is not a professional, witness such a jump in his income". Patra went on to allege that the rise in Gandhi's income "by and large, is profiteering from scams, dubious deals" and charged him with hiding facts from his election affidavits. The BJP leader said that the party will hold a series of such press conferences in the coming days to expose the "corruption of Rahul Gandhi". He alleged that Gandhi and his sister Priyanka Gandhi Vadra had a 4.69-acre farmhouse in Delhi that was rented out to a firm that had been issued show-cause notice for violations and alleged financial irregularities. On Saturday, Union minister Ravi Shanker Prasad had said, "In his (Rahul Gandhi) election affidavit in 2004, his income was Rs 55,38,123 while in 2009, it rose to Rs 2 crore and in 2014 it rose to Rs 9 crore. "We know how much an MP earns. We want to ask what is this Rahul Gandhi model of development without an ostensible source of income.